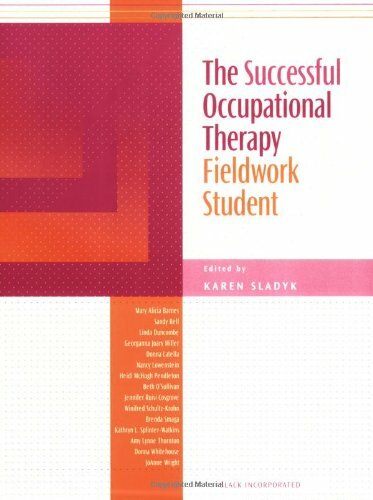 The Successful Occupational Therapy Fieldwork Student is a stimulating new book that paves the way to the profession of occupational therapy. This book fulfills the needs of all OT and OTA students throughout their entire education by fully preparing them for their fieldwork assignments. This is an imperative learning tool for all students since all curricula include Level I and II fieldwork requirements, ranging from the associate’s level to a master’s program. This complete fieldwork book contains a wide array of topics that guide the reader from the initial planning steps to the completion of successful fieldwork, including how to design fieldwork as a supervisor. It provides students with the opportunity to not only assess various situations, but also utilize their knowledge to demonstrate clinical reasoning. A multitude of activities are included from the first page to the last, designed to groom students for their fieldwork. The Successful Occupational Therapy Fieldwork Student is the ultimate resource for OT/OTA students and the clinicians who educate them, providing a wealth of information while allowing for clinical reasoning to occur. This one-of-a-kind book contains unique features that will prove beneficial to students at varying degrees of education. Each chapter includes activities and assignments for students to complete as they prepare for fieldwork. The text is filled with real-life fieldwork student cases. The text teaches how to prevent problems that can occur, as well as how to fix them when they do.